There was some stat that he has managed more CL games than every club but 4 participating. Record was miles miles better till 2011 though. We have lost far more in the last 4 years. In the last 4 years Arsenal didn't even try to win it tbh. Despite having our best squad in years. @RealGunner wrote: Despite having our best squad in years. Previous years squad would have dismantle Dinamo Zagreb even with 10men, because they all played in their strongest position and Wenger wasn't a mad man. Should be sacked if he doesn't knock mourinho out saturday. He's on the ropes and you hate him ffs. Take him out. I don't know. 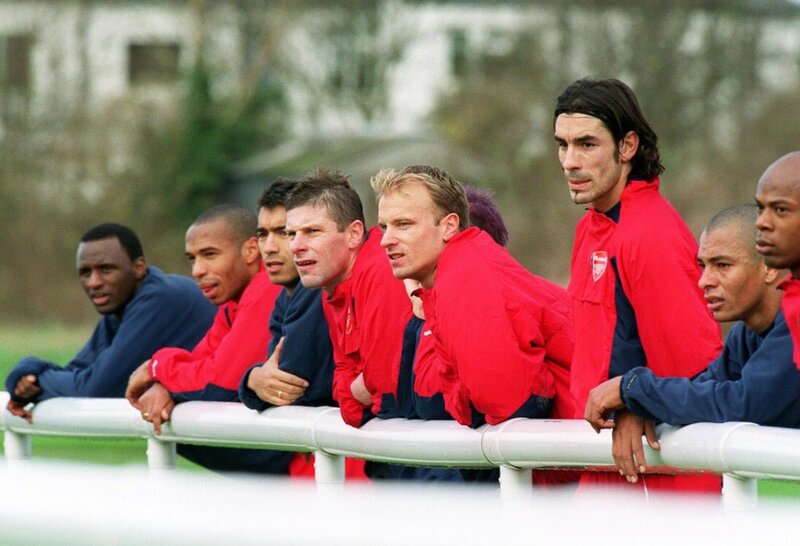 I think the strongest squad the Gunners have had since the invincibles was 2007/08 season. If I remember correctly, they topped the table until March...and then they pulled an Arsenal and blew everything away. Manchester was devastatingly strong at the time, and Ronaldo had risen above everybody else. But still, Arsenal would've won something hadn't they panicked at the last minute. They couldn't handle the pressure I guess. Arsenal: Class of 2007/08 season >>>>>> The current squad. The biggest difference between the squads is that the 2008 team had in-form Adebayor, who was undeniably better than any striker we have now. Everywhere else though I don't see the 2008 squad being decisively better than the current one. The midfields of both squads are about even, while the current defence and keeper are miles better than the 2008 one. I'd take Cech-Koscielny-Mertesacker over Almunia-Gallas-Toure any day. And Gabriel is much better cover than Senderos and Djourou were. Anyway, as far the Champions League go, the last four years have been less about not trying and more about simply not being good enough. I can't seriously get how any Arsenal fan can support Wenger. He doesn't sign a striker when it's the thing you needed the most. He gets your players injured. Because being manager for nearly twenty years and being the greatest manager we've ever had gives him a lot of leeway with supporters. There's also fact that things really aren't as bad with him as manager at the moment as some fans would have you believe. Adebayor is great when he's playing for a contract lol. I think wenger has completely destroyed any kind of pressure on Arsenal as a whole. He has done a great job convincing their supporters and players that top 4 is fine. With that kind of pressure do any one really expect those players to fight for title? Lack of pressure is what is making Arsenal stand still. Everything is fine,not challenging for titles is fine,top 4 is fine, finishing second in group stage is fine, R16 is fine,losing big games is fine,Hlebruary is fine,Giroud is fine,No DM is fine...rinse and repeat. @free_cat wrote: I can't seriously get how any Arsenal fan can support Wenger. I cant stand Wenger, and would love to see him leave but as a fan we have to support what we have. Wenger makes basic mistakes, not hard to fix but being as stubborn as he is, he will never change. GoonerJay29 wrote: Because being manager for nearly twenty years and being the greatest manager we've ever had gives him a lot of leeway with supporters. There's also fact that things really aren't as bad with him as manager at the moment as some fans would have you believe. Same old stuff. Retain possession, pass it in triangles between DM, CBs and FBs. Get it forward into the midfield to CM, FBs overlap, get the ball to them they bring it back into the midfield because they don't want to cross to Giroud they only cross when Walcott is playing. And we continue doing that passing thing in the final thrid until we somehow get a goal in some way finally. It's true I'm not that invested in the matches anymore and it is probably because of that, I do it more out of love and habit, and when we fck up I rarely get upset anymore. I don't disagree about the style, really. Most of the time we aren't that fun to watch. My point was more about how results-wise and our position as a club aren't as bad as some make out. Mind you, it's maybe not as good as some would have you believe, either. Everything is fine,not challenging for titles is fine,top 4 is fine, finishing second in group stage is fine, R16 is fine,losing big games is fine,Hlebruary is fine,Giroud is fine,No DM is fine...rinse and repeat. I haven't met a single fan with this mindset. I wish we could do that. We always start with Mignolet on the ball who gives it to Skrtel or Lovren with a terrible pass who gives it to FB who gives it back to Skrtel/Lovren who hoofs to Bentekkers. Who wins the header but no one is around him and the other team gets the ball. Rinse and repeat. Every 10 minutes Coutinho somehow manages to get on the ball do something great and then shoot from 40 yards out hitting the post or coming close to scoring but very rarely actually scoring. GoonerJay29 wrote: I don't disagree about the style, really. Most of the time we aren't that fun to watch. My point was more about how results-wise and our position as a club aren't as bad as some make out. Not the fans who has little to no influence on the club. It is about the club, the club is fine with things atm, even top 4 is like a trophy according to them...how far delusional they can be. Oh my God, the English game is horrible atm. What is this. Are we trying to out-bore each other here? When we play well we are really exciting; it's when we're "jaded" or off form in general that we become predictable and frustrating to watch. That said, are there really that many teams that are any more exciting than us? Not everyone can play like Barcelona and most teams set up specifically to stop us from playing. I'm not too arsed about it. As for this talk of Arsenal being happy with mediocre returns, we have just won a trophy in back-to-back seasons and the team has gotten stronger in each of the past few years. We didn't get a striker or DM like we certainly could have used for this season but things have improved compared to previous years. I don't feel my support of Wenger and the team is due to lower expectations; I'm just being realistic given we're better off than we were not so long ago. We could yet have a great year.